Estimote telemetry beacon devices are a family of Bluetooth beacons which broadcast location/proximity and environmental information. They can run for years without a battery change. The ones shown below are cookie sized and have adhesive tape on the back - they can be stuck most anywhere. When you buy an Estimote telemetry beacon, use the Estimote cellphone application to configure your beacons for maximum battery life. To do this, shut off Estimote location/proximity packets and enable only Estimote telemetry packets. Set the duration between packets for as many seconds as you can to lengthen the life of the battery. You may also be able to adjust the transmit power of the devices - lower power will conserve battery life, though it will also lower the range of the device. All Bluetooth devices have a unique ID, though not all devices have it written somewhere where you can see it. To find your Estimote's Bluetooth ID, use a Virtual Wiring Sniffer. When your Sniffer sees Bluetooth packets from unknown devices, it prints out their IDs. Notice that the first 2 data bytes of data are 0x9A and 0xFE (that's an Estimote company ID). The third byte is 22, which identifies the packet as an Estimote telemetry packet. The Bluetooth ID for this Estimote packet is: C3:15:10:FF:43:12. For each of your Estmote Devices, bring it near the Sniffer, look for a packet like the one above, and write down the Bluetooth ID. This is the ID you will use when creating your Estimote Devices. All the Estimote Beacon Devices we support are Telemetry Beacon Devices. The Telemetry Beacon Device is described in detail below. The Telemetry Beacon Device creates a Virtual Wiring Device which can monitor atmospheric pressure, light, temperature, and its battery. Atmospheric pressure is measured in hPa, light in Lux, and temperature in Fahrenheit and Celsius. Battery status is measured in percent, 100% being a fully charged battery and 0% being a dead battery. We've found that the Lux measurements vary quite a bit from one beacon to the next, so though they accurately measure none, some, or more light, the actual Lux values are not all that useful. 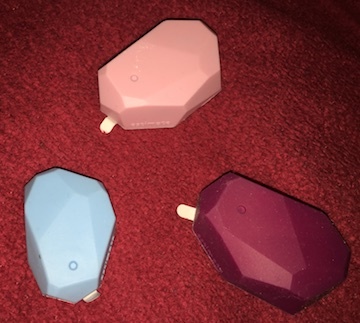 Not all Estimote beacons are the same. Some of the smaller devices only measure temperature, while others measure temperature and light, and still some others measure everything. In order to accommodate all the Estimote devices, the Telemetry Beacon Device Script is flexible, allowing you to create a Device which matches your Estimote device's capabilities. bluetooth_id : a quoted string with the Bluetooth ID of this device. Bluetooth IDs are unique IDs assigned to Bluetooth devices. To find your device's Bluetooth ID, bring your device within range of your Sniffer and read the Virtual Wiring Log. Bluetooth ID's are of the form: "D2:44:00:BC:D3:56"
measures_light : a true/false value which is set to true if the device measures light. Otherwise it is set to false. measures_pressure : a true/false value which is set to true if the device measures atmospheric pressure. Otherwise it is set to false. measures_temperature : a true/false value which is set to true if the device measures temperature. Otherwise it is set to false. The following parameters are optional - leaving them alone generally works and is advisable. scanner_name : a quoted string with the name of the scanner for the Sniffer this Device is using. If there is only one Sniffer in your system (typical), leave the string empty and the Device will use it by default. offset_c : a numeric value which will be added to temperature readings (in Celsius). If your device measures temperature and its temperature values are incorrect, use offset_c to adjust them. Running the TelemetryBeacon Script with the parameters listed below creates a Telemetry Beacon Device for a device with Bluetooth ID "D2:44:00:BC:D3:56" which measures temperature, and runs in a system with one Sniffer(scanner). The Telemetry Beacon Device will have the ID "tb" and an offset of 2.3 Celsius (4.1 degrees Farhenheit) added to all its temperature measurements. Running the TelemetryBeacon Script with the parameters listed below creates a Telemetry Beacon Device for a device with Bluetooth ID "D2:44:00:BC:D3:56" which measures light, pressure and temperature, and runs in a system with a Sniffer using a scanner named "vw_hcidump_comand". The Telemetry Beacon Device will have the ID "lptb" and an offset of -3.0 Celsius (-5.4 degrees Farhenheit) added to all its temperature measurements.